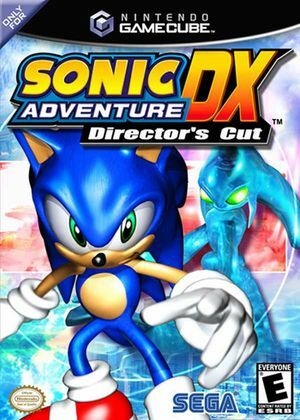 In Sonic Adventure DX: Director´s Cut Dr. Eggman is up to his old tricks again, but in this special Director's Cut version, there are a whole lot more of them to trip up Sonic and his pals. Get ready to go on 50 new adventures in the all-new Mission Mode as you strive to dismantle the evil genius' plans to rule the world. There are 12 exciting Bonus Games to unlock in the form of classic Sonic Game Gear titles. Whether you play as Sonic, Tails, Knuckles, Amy Rose, Big the Cat, or E102 Gamma, you'll get a unique adventure every time as each character has their own deep storyline and unique type of gameplay. Don't forget to visit your favorite Chao in the Chao Garden where you can take a break from saving the world and pit your Chao against others in a variety of tournaments. 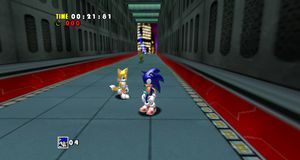 Since 5.0-5745, textures in Sonic Adventure DX: Director's Cut will appear blurry in the distance at internal resolutions above native, due to false positives in Arbitrary Mipmap Detection. Since 5.0-8296, this setting can be disabled to work around the issue. However, if any "mip trick" effects are used by the game, they will not work correctly. Concerns only the unlockable Game Gear game "Dr. Robotniks Mean Bean Machine": When playing in story mode, the screen often freezes randomly for a couple of seconds, but game play continues. Happens with both OpenGL and Direct 3D renderers. This Code fixes clipping and water issues with the Widescreen Hack. The graph below charts the compatibility with Sonic Adventure DX: Director's Cut since Dolphin's 2.0 release, listing revisions only where a compatibility change occurred. This page was last edited on 11 November 2018, at 15:17.